The current prevalence of type 2 diabetes has reached an epidemic proportions, increasing the risk of cardiovascular events and premature death globally. The global prevalence of type 2 diabetes is 8.3% with the highest burden of the disease in developing countries. About 7 000 new cases of type 2 diabetes are diagnosed in Latvia every year. Metformin is the first-line antidiabetic agent used in pharmacotherapy of type 2 diabetes to improve glucose homeostasis. Nevertheless variable interindividual therapeutic efficacy and high risk of metformin-related gastrointestinal side effects (e.g. nausea, diarrhea, vomiting) are observed, justifying the necessity for a personalized therapeutic strategy in the treatment of type 2 diabetes. Pharmacogenetic and clinical study of type 2 diabetes mellitus (OPTIMED) has been happening since year 2010 in collaboration with hospital and doctors’ practices in Latvia with aim to develop clinically well-characterized and longitudinally surveyed patient cohort and to collect the corresponding biosamples and associated clinical data. The main aim of the study is to perform wide-spectrum research on the action mechanisms of metformin by analyzing genetic material extracted from white blood cells and gut microbiome samples. Currently, more than 600 type 2 diabetes mellitus (T2DM) patients have been involved in the study, which has contributed to the identification of new genetic markers for antidiabetic therapy. With the development of T2DM in-depth research and the diversity of research trends, it has become necessary to involve especially the newly-diagnosed T2DM patients who have not yet begun the medication therapy, and to obtain clinically complete data on treatment changes over time. For the patients in OPTIMED cohort DNA, plasma, serum and stool is avvailable for research. Within framework of OPTIMED samples are analysed with novel molecular methods to widen knowledge about pharmacodinamics of metformin. The research of this unique cohort is continued within several research projects. Researchers are open for collaboration proposals, please, contact klovins@biomed.lu.lv. Information about research collaboration here. Rovite V, Wolff-Sagi Y, Zaharenko L, Nikitina-Zake L, Grens E, Klovins J. Genome Database of the Latvian Population (LGDB): Design, Goals, and Primary Results. Journal of Epidemiology. 2018;28(8):353-360. doi:10.2188/jea.JE20170079. Elbere I, Kalnina I, Silamikelis I, Konrade I, Zaharenko L, Sekace K, et al. (2018) Association of metformin administration with gut microbiome dysbiosis in healthy volunteers. PLoS ONE 13(9): e0204317. Dujic, T., Zhou, K., Yee, S. W., van Leeuwen, N., de Keyser, C. E., Javorsky, M., Goswami, S., Zaharenko, L., Christensen, M. M. H., Out, M., Tavendale, R., Kubo, M., Hedderson, M. M., van der Heijden, A. A., Klimcakova, L., Pirags, V., Kooy, A., Brosen, K., Klovins, J., Semiz, S., Tkac, I., Stricker, B. H., Palmer, C. N. A., 't Hart, L. M., Giacomini, K. M. and Pearson, E. R. 2017. Variants in Pharmacokinetic Transporters and Glycemic Response to Metformin: A MetGen Meta-Analysis. - Clinical Pharmacology & Therapeutics, 101 (6): 763-772. Zaharenko, Linda et al. 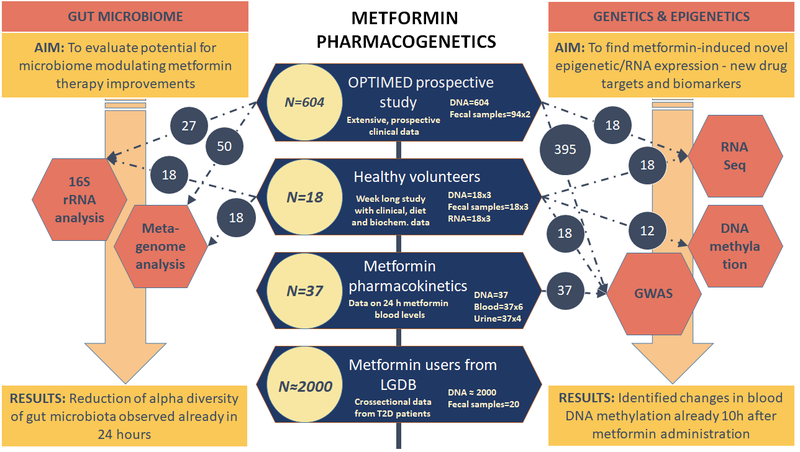 “Single nucleotide polymorphisms in the intergenic region between metformin transporter OCT2 and OCT3 coding genes are associated with short-term response to metformin monotherapy in type 2 diabetes mellitus patients.” European journal of endocrinology 175 6 (2016): 531-540. Zhou, K. X., Yee, S. W., Seiser, E. L., van Leeuwen, N., Tavendalel, R., Bennett, A. J., Groves, C. J., Coleman, R. L., van der Heijden, A. A., Beulens, J. W., de Keyser, C. E., Zaharenkoll, L., Rotroff', D. M., Out, M., Jablonski, K. A., Chen, L., Javorsky, M., Zidzik, J., Levin, A. M., Williams, L. K., Dujic, T., Semiz, S., Kubo, M., Chien, H. C., Maeda, S., Witte, J. S., Wu, L. Y., Tkac, I., Kooy, A., van Schaik, R. H. N., Stehouwer, C. D. A., Logie, L., Sutherland, C., Klovins, J., Pirags, V., Hofman, A., Stricker, B. H., Motsinger-Reif, A. A., Wagner, M. J., Innocenti, F., Hart, L. M. T., Holman, R. R., McCarthy, M. I., Hedderson, M. M., Palmer, C. N. A., Florez, J. C., Giacomini, K. M., Pearson, E. R., Investigators, M., Investigators, D. and Investigators, A. 2016. Variation in the glucose transporter gene SLC2A2 is associated with glycemic response to metformin. - Nature Genetics, 48 (9): 1055-+. Kalnina I, Zaharenko L, Vaivade I, Rovite V, Nikitina-Zake L, Peculis R, Fridmanis D, Geldnere K, Jacobsson JA, Almen MS, et al: Polymorphisms in FTO and near TMEM18 associate with type 2 diabetes and predispose to younger age at diagnosis of diabetes. Gene 2013, 527:462-468. Peculis, R., Konrade, I., Skapare, E., Fridmanis, D., Nikitina-Zake, L., Lejnieks, A., Pirags, V., Dambrova, M. and Klovins, J. 2013. Identification of glyoxalase 1 polymorphisms associated with enzyme activity. - Gene, 515 (1): 140-143. Kalnina, I., Geldnere, K., Tarasova, L., Nikitina-Zake, L., Peculis, R., Fridmanis, D., Pirags, V. and Klovins, J. 2012. Stronger Association of Common Variants in TCF7L2 Gene with Nonobese Type 2 Diabetes in the Latvian Population. - Exp Clin Endocrinol Diabetes, 120 (08): 466-468. State Agency of Medicines of the Republic of Latvia clinical tial approval No. 17-1723, reg. No. 2016‑001092‑74.